The IAS AC472 metal building systems inspection accreditation is one of several accreditation services FET offers for the metal building industry. The IAS AC472 audit is a complete audit reviewing processes, quality and procedures for metal building manufacturers. This audit replaced the AISC audit for the quality program for pre-engineered metal building systems. 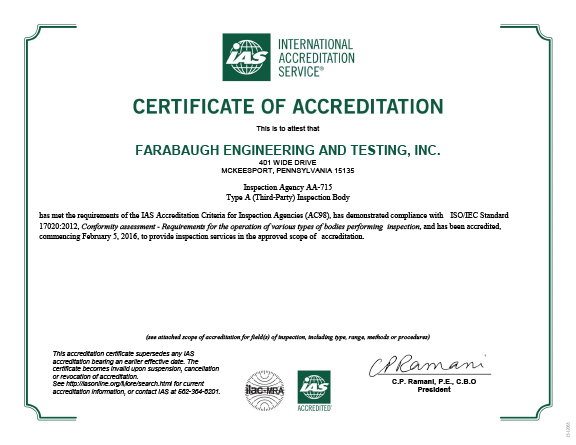 Farabaugh Engineering and Testing is a fully accredited inspection agency for the International Accreditation Service (IAS). We have received our certification to preform the metal building systems, metal building components and metal building assembly (erection) audits. The IAS AC472 program is the Metal Building Systems Inspection Accreditation. The accreditation is based on requirements in IAS Accreditation Criteria AC472 and the International Building Code®. This program is a quality audit for the manufacturing of pre-engineered metal building systems. The audit goes through the process of manufacturing metal building systems including certifying welds, reviewing a manufacturers Quality Control manual, and the overall company hierarchy from purchasing to shipping. When a company achieves their AC472 certification it certifies that the company is knowledgeable and possess quality practices for manufacturing a quality metal building system. If you are a metal building manufacturer it is required for you to have the AC472 certification for certain jobs. There are companies and government agencies that require a metal building manufacturer possess the IAS AC472 certification. This is an ongoing audit process. Once a manufacturer has achieved their AC472 certification they must maintain that status. Audits are conducted by a third party (FET) to achieve and maintain this certification. Who Recognizes the IAS AC472 Certification? If you are looking for more information or would like to have your company audited for the AC472 program please contact us using the form on this page.